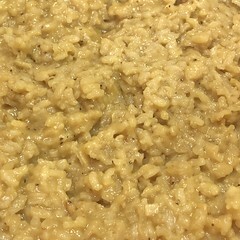 Risotto may not be one of the ‘king of quick’ sides, but the reward for the time spent making it is tremendous. If you make a large enough batch you can use the leftovers creatively by adding peas (Risi e Bisi), sun-dried tomatoes, asparagus, rapini or even broccoli. Another super way to use risotto is to make Arancini (rice balls) – a guaranteed hit! You can cook Arborio rice similarly to regular rice but we recommend sticking to this fairly traditional method. Try adding peas, sun-dried tomatoes or possibly folding in asparagus, rapini or broccoli. Sprinkle with chopped flat-leaf parsley. 1. Using 2-3 tbsp pf olive oil, sauté onions and garlic until onions (or shallots) are translucent and garlic soften. Near the end add 1-2 tbsp butter. 2. When the butter has melted, add the Arborio rice. Mix well until all grains are coated with the butter and oil. Cook until the grains absorb the liquid, you can begin to smell the rice toasting. 4. Once the rice is ready, add the cup of white wine, mix well while cooking allowing the liquid to be absorbed by the rice. 5. Once the wine has been adequately absorbed by the rice, follow the same procedure and add the warmed stock a single cup at a time. Always wait for the liquid to be absorbed by the rice before adding another cup of warm stock. 6. Before the last cup of broth you can add the Pecorino Romano. 7. Add last cup of broth and cook until the risotto is as to the consistency of your liking. Add salt and pepper to taste. Garnish with fresh chopped flt-leaf parsley.